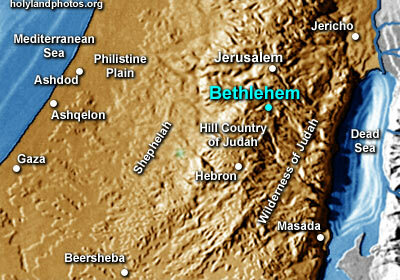 Bethlehem is located 5 mi. [8 km.] south southwest of Jerusalem. It was a city in the tribal territory of Judah. The ancestors of King David lived here — Ruth, Naomi, Boaz, Jesse, etc. It is mentioned 40 times in the Old Testament. Besides being the birthplace of David (1 Samuel 16) it was fortified by the Judean King Rehoboam (ca. 926 B.C. ; 2 Chron 11:6) and resettled by Jews after the Babylonian Exile (Ezra 2:21; Neh 7:26). It is mentioned 8 times in the New Testament, especially in connection with the birth of Jesus (Matt 2:5–12, 16; etc.). The focal point of the town is the Church of Nativity which is built over the site where tradition has it that Jesus was born. There, Christmas celebrations are held at various times by the Christian communities that have "rights" to/in the building.